If you are a regular reader of my blog, it’s probably become obvious to you that I am not a big baker, and there’s a reason why. I absolutely hate measuring and following recipes! Beautiful cupcakes and colorful frostings and delicious homemade breads are the specialty of other bloggers. Other than some posts about traditional Colombian baked goods and my simple cake creations, I am mostly about cooking savory meals. Today I want to share a Coconut Tres Leches Cake with you that I made a week ago that was absolutely delicious. This cake should be eaten cold, so if you are making it for a party, plan to have this in the refrigerator for about 3 hours before serving. If the cake is eaten warm, it will be too sweet! Grease and lightly flour a baking dish. 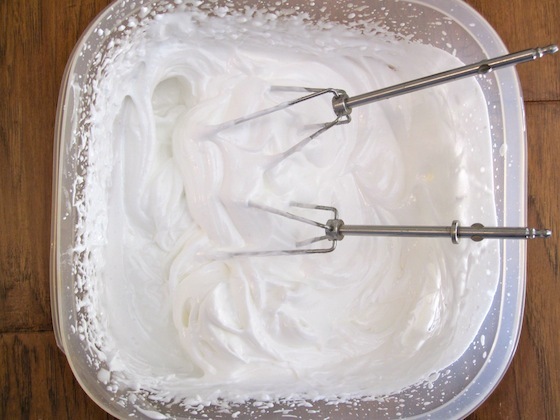 To make the cake: In a bowl whisk together the flour, salt and baking powder. In a small pot heat the milk and butter, remove from the heat and set aside. In a large bowl beat the eggs with an electric mixer on high speed for 2 minutes. Add the sugar and continue mixing for 5 minutes. Reduce the speed to low. Add the flour mixture, butter mixture, coconut cream and coconut extract and mix for 1 more minute. Pour the batter into the baking dish and bake for 40 to 45 minutes or until a toothpick stuck in the middle comes out clean. Remove cake from the oven and with a fork make holes all over the top of the cake. Set aside to cool for 10 to 15 minutes. 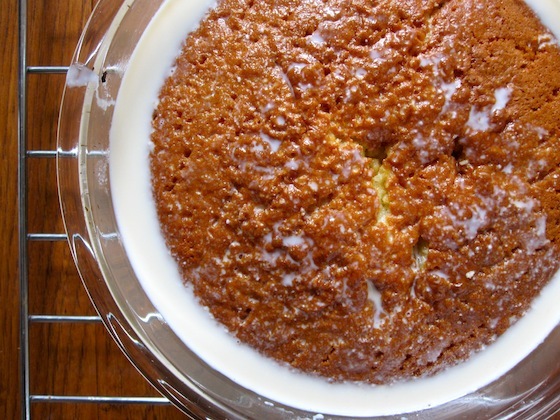 When the cake is cooling, make the milk sauce, whisk together sweetened condensed milk, evaporated milk, coconut milk and coconut extract in a mixing bowl. Pour the 3 milks sauce over the cake until it is all absorbed. 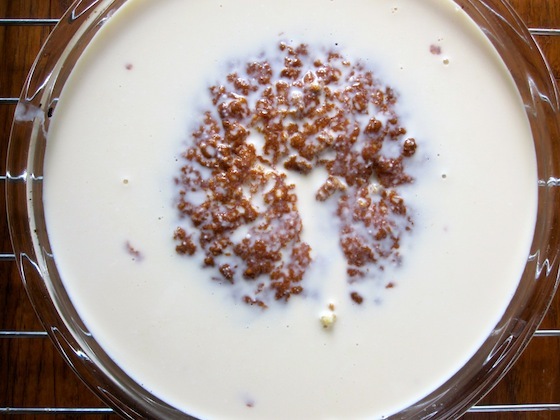 Refrigerate for a least 3 hours or overnight before frosting. For the frosting, in a small pot mix the water and sugar, over medium high heat, stirring constantly for 5 minutes. Set aside. Beat the egg whites with cream of tartar until stiff peaks are formed. While beating the egg whites, add sugar syrup and continue beating for 5 more minutes. Add coconut extract and beat 1 more minute. Spread the frosting over the cake and refrigerate until ready to serve. 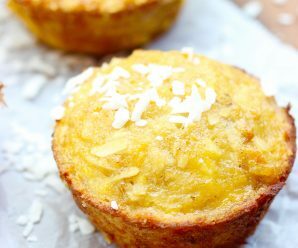 Sprinkle the top with coconut and serve. Nice recipe, Going to try. But will like to see a pic. when done to see the presentation, and how it looks. Thanks. 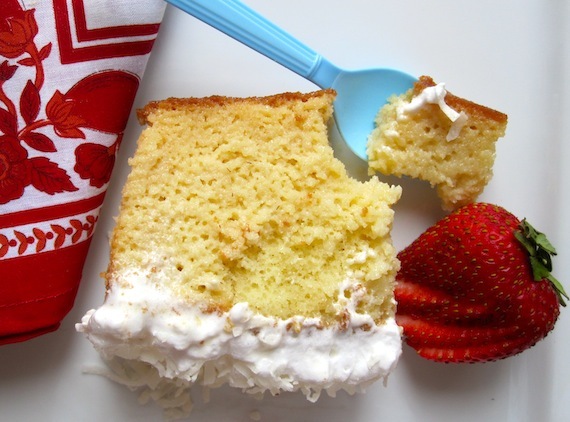 I love tres leches cake and coconut – they just have to be good together! I have one question… When do you use the shredded coconut? 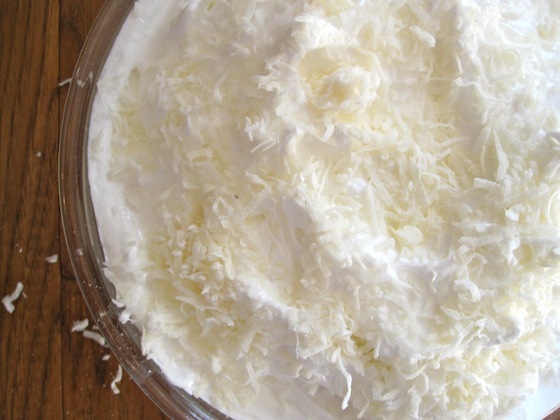 Kari- Sprinkle the shredded coconut on top of the frosting. 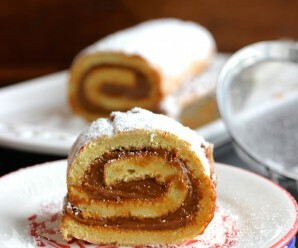 this looks absolutely divine ! will try it soon !! You sound so much like me….baking is for the other blogs. This looks amazing though and I will definitely try it! i love how a tres leches cake simply melts in your mouth, and adding coconut definitely improves it even more in my eyes. lovely! What size baking dish should I use? The cake is in the oven right now! I’ve had it twice before, just haven’t made it myself until today. Hope it works out, it’s a surprise cake for my mum’s birthday! Thank you so much!! I have asked mi mami to bring some cooking books from Colombia but translated in english and no luck!! I will definitely try this for sure! What size baking pan should I use? 9 by 13 works well. But make sure it’s a deep pan. I’ve used the typical 2 inch pan and the sauce runs over the sides. Especially if you plan on transporting the cake. Now my pans are no less than 3 inches deep. 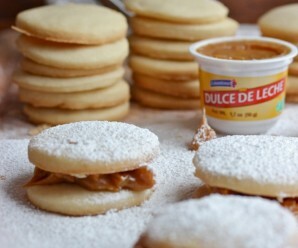 Moreover, for the tres leches sauce, what size cans should I use for the sweetened condensed milk, evaporated milk, and coconut milk? Thanks in advance! Hola. Me llamo Chelsey. Soy de estudiante de español. Esto receta es muy buen. Me encanto la tarta.También, mi madre me gusta esto. Primero, you cometí un error pero yo termina la tarta y yo cocina esto nuevo cuando you tengo pasatiempo. Gracias por esto receta.